An agile 4WD drivetrain. A powerful micro motor. And realistic short course details. The 1/24-Scale Electric RTR 4WD Short Course Truck has it all. What’s more, it’s ready to run and comes with a rechargeable battery pack and charger. This truck is fully equipped to attack the short course. All you need to do is take it out of the box, charge the battery and let it rip. Losi® brushless powered micros deliver quicker acceleration and higher speeds designed with the experienced micro racer in mind. 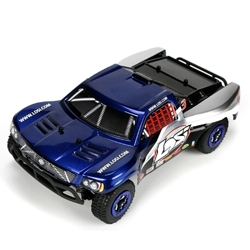 Equipped with interference-free Losi 2.4GHz DSM radio system, these micros can run with the competition without the hassle of changing crystals to find an open frequency. Our lightweight DSM transmitter only uses 4 AA alkaline batteries (included) and comes with a short antenna only found on 2.4GHz systems. Since it’s a micro you can run it almost anywhere, but for some friendly competition with adjustable jumps and a checkered finish line, we recommend running on the optional Losi Micro Track (see optional accessories).